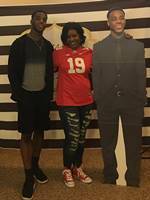 A Cardboard cutout standee is the perfect addition to any graduation party. Show off your graduate with a graduation cutout. We can help you get ready for the party with a graduation cap cutout. Read below to see what our customers had to say about their experience with our graduation cutouts. "My 2 Dallas' were at the party! Go Bucks! ##19snumber1fan"